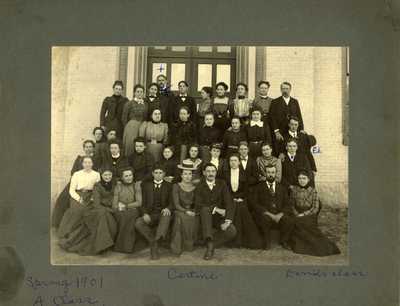 "Spring 1901 Class, Castine "
A black and white photograph in the papers of Carrie Rand Dolloff, a Maine teacher who married David E. Dolloff in 1906. The photograph is labeled "Spring 1901 A Class, Castine, David's class." The finding aid for the collection notes that David attended Eastern State Normal School at Castine, but the school name is not mentioned on the photograph. One person, in the second row, right, is labeled Ed.